MADE ENTIRELY FROM ORGANIC ACTIVE INGREDIENTS, no binders, fillers or carriers in a base of chlorella (a nutrient-dense green superfood). NATURALLY SUPPORT HORMONE BALANCE, ENERGY AND LIBIDO. Traditionally maca root has been used for its remarkable adaptogenic properties. Adaptogens are a unique group of herbal ingredients traditionally used to improve the body’s hormonal responses and balances, to promote longevity and boost energy and libido. 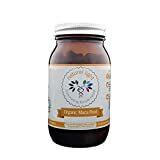 AMAZING NATURAL MENOPAUSE SYMPTOM SUPPORT – Maca also seems to be an amazing herbal solution for menopause by affecting hypothalamic action; important to all hormonal therapies and increased thermogenesis. RECOMMENDED by the highly regarded Nutritional Medical Practitioner and gynaecologist Dr. Elena Leschen (MD). NATURAL LIGHT SPECIALISES in pure and organic supplements designed specifically for female health goals, and… absolutely nothing else. 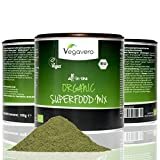 This organic Maca is a whole botanical product (not extract) in a base of chlorella (a nutrient dense green superfood). Made entirely from active ingredients, no binders, fillers or carriers. Lepidium meyenii (maca) is an herbaceous plant of the crucifer family native to the high Andes of Peru, grown for its fleshy roots. Be sure to avoid inexpensive varieties, as they are generally ineffective. Traditionally Maca has been used for its remarkable adaptogenic properties. Adaptogens are a unique group of herbal ingredients traditionally used to improve the body’s hormonal response to stress, to balance hormones, promote energy, promote longevity and to boost libido. Maca also seems to be an amazing adaptogenic herbal solution for menopause that has helped many women. Maca affects hypothalamic action; important to all hormonal therapies and increased thermogenesis. Maca is rich is polyphenols, some of which have been shown to have a HRT-like benefits without the drawbacks, and are associated with a lowered risk of heart disease. Phtyoestrogens or “plant-oestrogens” are also found in high quality maca. Taken before menopause they can moderate day-to-day oestrogen levels lessening the drop in oestrogen at the advert of menopause.